As part of the Just Cause : Bad Faith exhibition, artist Antonio Serna will discuss his ongoing project ‘Documents of Resistance’ and the ‘Timelines’ presented in the current exhibition. 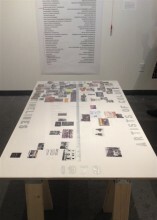 The visuals presented on these two timelines give us an overview of the people and activities that occurred during these two turbulent decades. What can we learn through this visual intersection of activities by groups such as the Young Lords, Brown Berets, Women Students and Artists for Black Art Liberation, and what more might be explored?